It doesn’t get much easier than this. And I like simple and easy! I use this idea year round when I want to add some quick and festive flair for any event, and this is one of the cutest variations ever! We used Mason jars last winter to line our front walk way for guests, we used them this summer at my daughter’s wedding reception, and as you can see, you can use them for fall decorating too! All year round I’ve used Epsom salts to simulate snow or sand. I love the candy corn. You could try coffee beans, shells, jelly beans, marbles, cranberries … and change candle colors to coordinate with your event! The options are endless! Great idea!!! I like them!! A few Easters ago I used mason jars for my table decoration. I purchased a six pack of purple petunias and just place the entire piece, dirt and all into the jar. It looked great. It’s great to use jars like this. I’ve done it for several years and I love to just put a candle in them. I love the idea of using Mason jars, but I have to admit I’ve never used them for decorating (just canning). 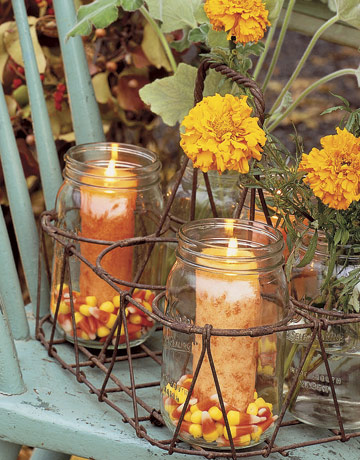 I love the way they look with the candy corn in that rusty wire holder. And their also great with the salt on the mossy stones. Winston is pretty cute too! Great idea about using the epsom salts to look like snow or sand. Yep – they are awesome! Love the candy corn. We used them to line the drive way with candles for a party. I love this idea. I’m going to use it on my porch as I have mason jars in abundance. I’m thinking they’d be fun for Halloween and Thanksgiving. I have a great collection of glass jars to use for this purpose… love the idea of the different decorative touches though! Simple and beautiful. I use them all the time in the summer for lighting up the garden. But at Christmas they are great for decorating sideboards and tables with candles and floral arrangements if you have little ones around. Okay, very weird. I just filled 2 mason jars with coffee beans for decoration yesterday!! I have been wanting to decorate with candy corn…and I have been wanting to use this old milk bottle holder I have…but never thought of combining the 2…now I need something that will fit in my milk bottle holder…Mason Jars would be too big…but the same concept with something smaller…hmmmmm….what do I have around here??? Wait, do Mason jars come in different sizes? lol The gears are spinning in my head…. Canning jars are one of my very favorite things! They are such a simple pleasure! Great ideas, as always! Thanks for the ideas. Love the wire holder! Wait a second…. now everyone will know my secret of easy decorating….. =) I love mason jars. I have tons in a box and I have used them for almost any celebration – housewarming party centerpieces, fall decor, winter decor, entertaining…. They really are so simple to make work for any occasion. We were about to throw some old mason jars away after cleaning out the cupboards, thanks for the new ideas on how to use them in a fun new way. This is one of favorite and cheap ways to change the outside of our home every season. Love the candy corn idea! I’m a total candles in jars freak. I saw it a long time ago in a magazine – I believe they were hanging down from a tree using wire – and have just always loved the simplicity of it. And it’s a great way to recycle jars. I love it! So simple…so elegant! Thanks for another great idea! I really love the idea in the first picture. Mason jars are favourites of mine. I love all the ideas people are sharing. I’ve taken the smaller ones, wrapped wire around them and hung them in trees with votive candles in sand. So pretty twinkling on a dusky summer evening. Those look great! I love that idea! thak you , i like them!!! Love the candles in salt on top of that moss. Gorgeous. That first photo is so pretty – I love it. Thanks for sharing! Epsom salts is a great idea! I love your two bottom photos :) Thanks for sharing! I love all the photos! Thanks for the ideas! I love this idea. A dear friend recently hosted a graduation party for her daughter. She had kind of a vintage, garden party theme and she scattered mason jars with candles all throughout her gardens. It was so beautiful. Mmmmm… love these too. Except here lately my husband has started using them as big cups. Blast! These are really pretty, Melissa….thanks for the inspiration…..can’t beat candles for coziness. This IS something I COULD do with my nondecorating, uncolorcoordinated self! Thank you .. I will get to work this weekend and share your ideas w/ my sister. I couldn’t agree more! Mason jars work for so many looks for dinner parties, or outdoor gatherings! I have quite a growing collection and even include jars that I have found with designs on them, they look beautiful at night! I love the epsom salts! My favorite masons are the aqua colored ones. Here’s how I did the one’s in my blog: Rim with seashell trim, make a loop hanger with rusty wire, fill with sand and shells, add a votive and voila! Mason jar hanging lantern Santa Cruz style. very simple, and very beautiful. Thank you! I have hundreds of mason jars and have only thought of using them to display beans and rice and such. What a great idea. I’ll be using this one!! I use large Mason jars to hold white and brown sugar. Makes a cute display in the kitchen and it’s useful too! These are great ideas! I’ll be linking to this post. For those on a budget or who don’t can, spaghetti sauce jars are nearly as good. So simple, yet soooo perfect!! Finally…candy corn put to good use! I love using mason jars. They can serve so many different purposes and still look so chic and fabulous! Fantastic Post! Cool and cheap ideas. More please. These are beautiful! Thanks for the great ideas! if Bella should happen to return, frappichino jars would probably fit in her holder…just a thought! Todo el año podrás utilizar estas luminarias. Algo tan sencillo y económico, no debe de existir! Es tan sencillo y fácil de lograr. Podrás disimular la nieve con sal, o si lo prefieres más colorido podrás usar granos de maíz y de ahí en más deja volar tu imaginación, con granos de café, conchas, caracoles, caramelos, canicas…..y todo lo que se te ocurra para decorar estos frascos. Las opciones son infinitas, y podrás decorar e iluminar todos tus eventos! The Mason jars look so creative the way that you have used them. candy corn looks great in them as do the candles. I am getting married at the end of March. My future name will be Mason. I am planning to have drinks served in Mason jars as people exit the ceremont but would love another way to incorporate them into my decor. Any ideas? just bought a box of these for storing my seeds – and who’d have thought i’ll get such other fun usage out of them. sweet! What a wondeful way to light up a walk way just brilliant. Wonderful idea, so simple yet stunning! Love all the ideas! 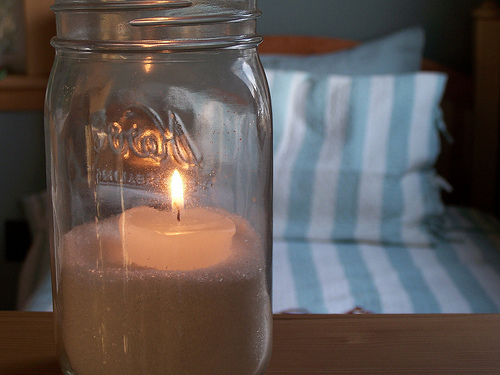 Using small peebles or aquarium gravel w’candles and tieing twine around mouth of jar is also very neat & inexpensive. We’re trying to get ready for a country wedding, anymore ideas please share. Thanks ya’ll. I use mason jars to organize my craft supplies. They’re cheap and it’s easy to see what I have! i recently used mason jars in a blog post as well! I know this post is about using mason jars, but I really loved the idea of putting candy corn in the bottom of the jar. So cute! You inspired me to create my own similar centerpiece. Thanks for sharing! Made your mason jar candles last year for the Holidays! I love the candycorn! gonna have to use it for my fall holidays! Cute Idea for sure!!! Happy Fall to you and your family!! !